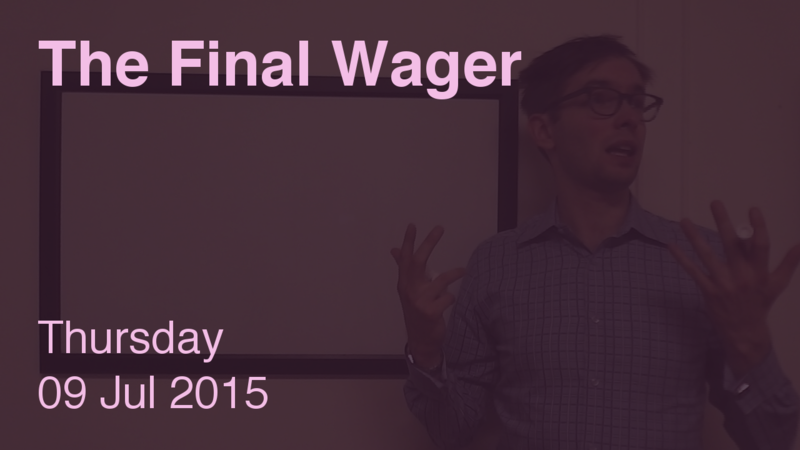 OK, ladies – please make the Penultimate Wagers go away! Had me scared there for a bit – it wasn’t until more than halfway through Double Jeopardy! that we found the first Daily Double. A miss by Heather and a get by Kathy on the $1,600 penultimate clue is making this one really close. We saw very similar scores in Julia Collins’s first game. If Kathy doubles her score, she’ll have 14,400. To cover this all-in wager, Heather will need to wager 7,000. An incorrect response with that wager will leave Heather with 400. To stay above her total, Kathy can wager up to 6,800. Jenny can wager up to 3,800. A successful doubling will put Jenny at 8,400. To cover this, Kathy should wager at least 1,200. …and might as well make it 2,200 to be safe in case Heather goes for the 1,000 wager. There are no second-order wagers here – first and second are too close, and Jenny is too far away. A chemist missing a clue about chemistry? Those of you who haven’t been on the show now have an idea of how difficult it is under the lights – it’s very, very easy to miss one key word or phrase in the clue. If you’re scanning this clue, you might fixate on “noble gases” and “highest score” and jump right to what Jenny said. Heck, I missed my last Final Jeopardy! simply because I had forgotten the category was U.S. ISLANDS, not U.S. CITIES. Jenny and Heather both tacked on $200 more than they should have, but one wager is more dangerous over the long haul, and it gets the pink.